Who was responsible for the ironic message of this sign in documentary Detropia? This week in movies you missed: Want to see how America might look after a full economic collapse? Look at Detroit. In this documentary, directors Heidi Ewing and Rachel Grady (Jesus Camp) present present-day Detroit with little commentary. It starts with images: a young woman exploring abandoned buildings. Opera singers on stage. Grass encroaching on bricks and pavement. Then we meet the people: a video blogger who loves the city too much to leave, just chronicles its decay. A union man who remembers when a string of vacant lots were thriving factories. A nightclub owner who quotes radical sociologists. And we get the stats: In 1930, Detroit was the fastest-growing city in America. Now its the fastest shrinking. In the past 50 years, it lost half its population. Unemployment, the mayor says, stands at 50 percent. City government wants to move residents out of dying neighborhoods where its too costly to provide services, then turn them into urban gardens. Residents arent having it. And the final irony: Now that prosperity has moved out of Detroit, the hipsters and starving artists are moving in. You may have caught Detropia at last falls Vermont International Film Festival. First the critique: By not providing expert commentary via talking heads, Ewing and Grady limit what they can do. 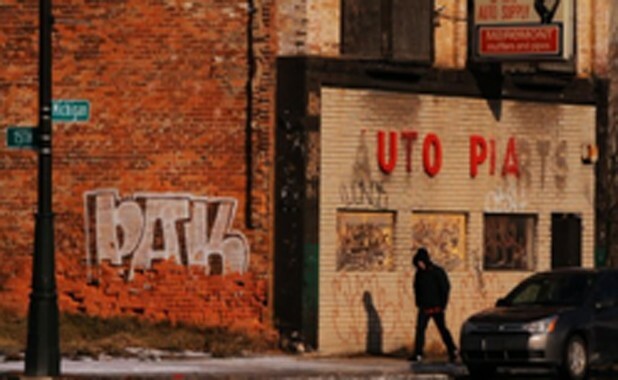 Detropia doesnt feel like a comprehensive portrait of Detroit; it doesnt weigh the urban planners opinions against residents interests or suggest a solution to the citys woes. Perhaps too much weight is given to the speechifying of the owner of the Raven Lounge  a fascinating, passionate guy, but not necessarily informed in his views. Hes the one who voices the documentarys dark, underlying implication: As Detroit goes, so goes America. Then, in the DVD extras, he rants about Arabs, which suddenly makes him seem less like a credible armchair philosopher and more like an angry caller on AM radio. But, as a fan of experiential documentaries, I loved Detropia as a moody, oddly beautiful experience that also provided some information. Some have criticized it for turning urban decay into found art (see the photo above). The film touches on the issue of exploitation in a scene where two young men from Switzerland admit they came to Detroit as tourists, because the ruins are more interesting than anything their home has to offer. Crystal Starr, the video blogger, also finds the postapocalyptic landscape interesting. But for her, its something more: home. Verdict: Do you take a strange pleasure in watching the mighty fall? Read Shelleys Ozymandias, then sit down and watch Detropia. And ask yourself whether it's really the empire builders who suffer most from an empire's collapse.